The Talbot Lago was a product of the French Talbot Company. In 1935 Anthony Lago assumed the head of the collapsed Anglo-French Sunbeam-Talbot-Darracq company and restructured it. After the end of hostilities in Europe he planned a resurgence of the name and decided sports cars where to be an important part of the company business. The race track has always been the proving ground of many companies and Lago recognised that they had also to do well in competition. 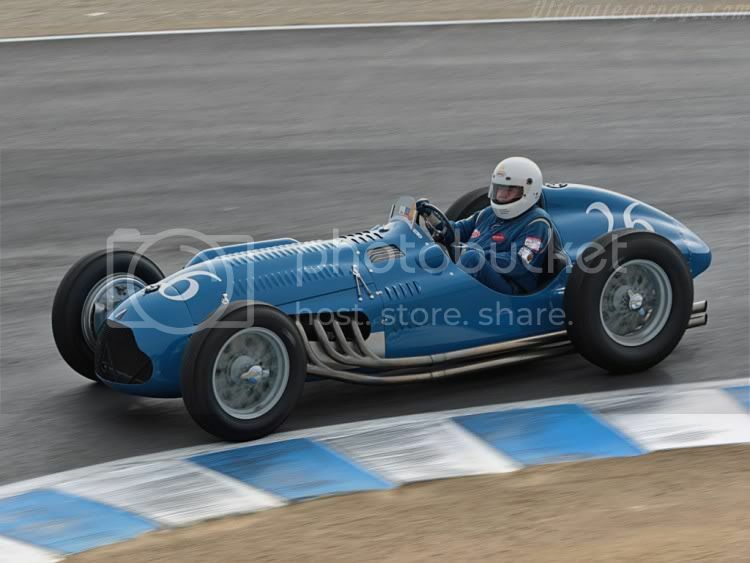 Indeed, Talbot racer Louis Rosier drove a Lago T26 GS sports car to outright Le Mans victory in 1950. 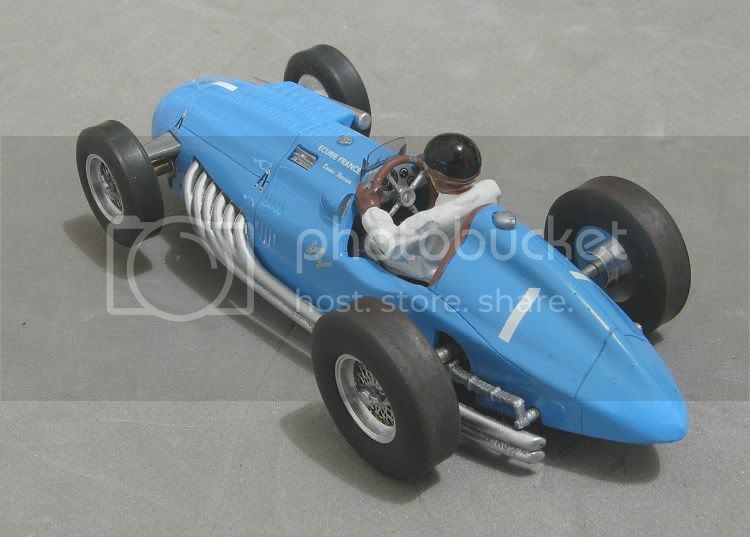 This car was using the same vital automotive parts as the Lago T26C GP car. Louis Rosier, who is the nominated driver of this model, was a Renault dealer and had built up a small successful Renault outlet in Clermont – Ferrand, France. 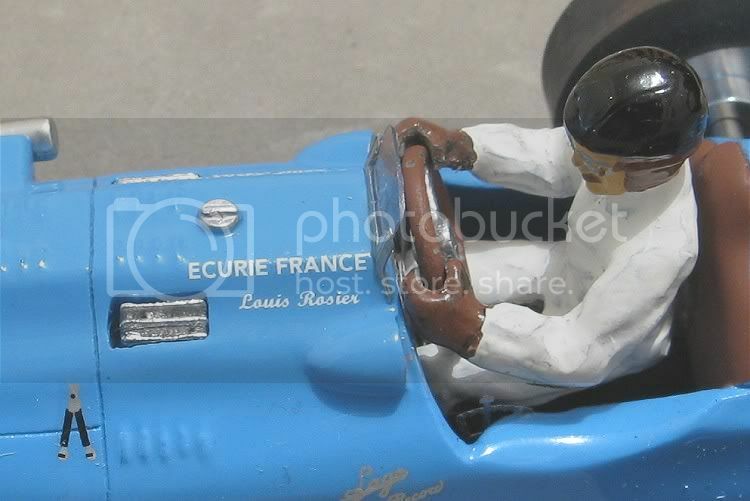 A late comer to motorsport who at the age of forty five formed his own racing team called Ecurie Rosier. Talbot were his choice of race car and soon he had a couple contending much of the early world championship circuits, which in those days only had eight or nine rounds, which included Indianapolis!, although very few European racers made it there. Other claims to fame for Louis was the establishment of a new French race track at Clermont Ferrand, called, funnily enough, Circuit Louis Rosier. 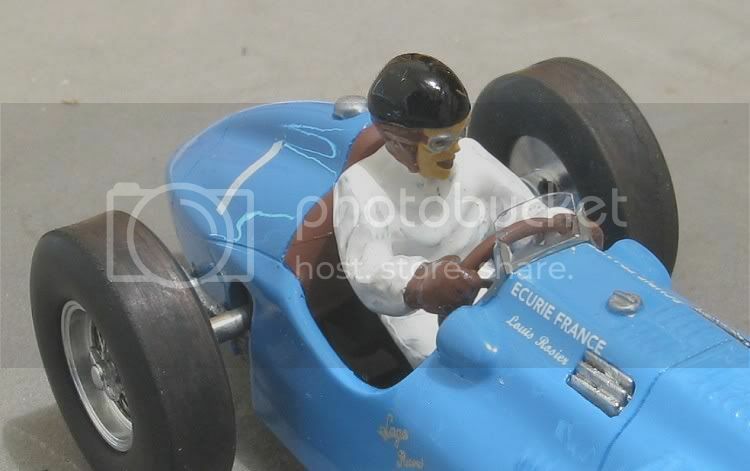 He also teamed up with body stylers in France and in America and designed sports cars based around the Renault 4CV Tragically, he died in a racing incident at Montlhéry in France. 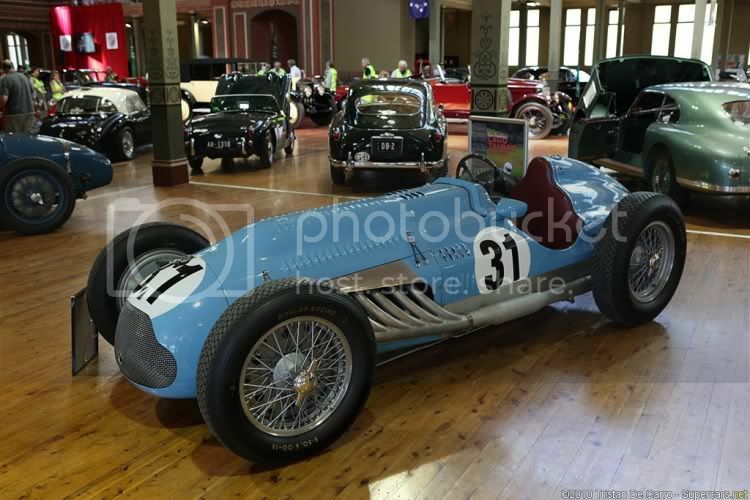 Several Teams contested the World GP championships from 1950 onwards using Talbot Lago racing cars but the writing was on the wall. Post war taxes on cars with large engines crippled several makes in the fifties, and by 1959 Talbot had been sold to Simca. Fortunately for us, Talbot still conjures images of the titanic struggle between post war racing car manufacturers and Talbot gave as good as it got for a while. The road going sports cars enjoyed a small but faithful following and Talbot went on to produce some beautiful models which a lot of us would not recognise in the streets! Because of their low volume they have become highly sort after and in 2005 at Pebble Beach, a 1938 T150-C Lago Speciale Teardrop Coupé sold for $3.685 million. At least we can have the real thing in miniature, and with the help of Monoplace, at a good price too! 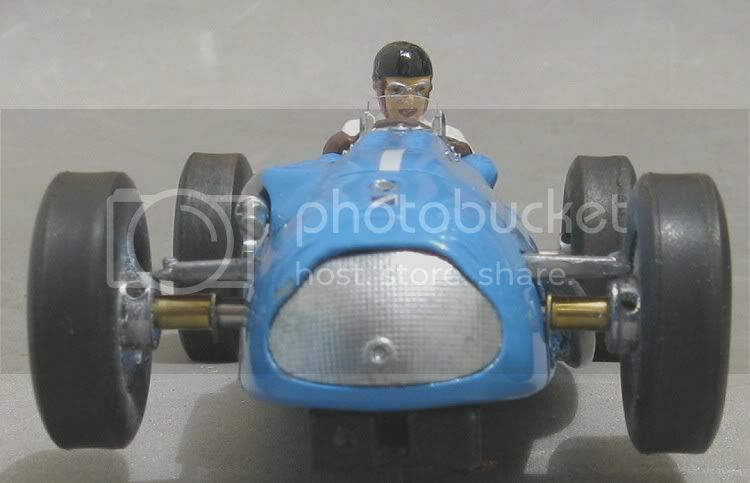 Monoplace are a ‘boutique’ slotcar maker from France; probably made on the kitchen table of a farmhouse in rural France. Nonetheless, they make a very nice model and have a select range of desirable models in their catalogue. The only problem is that they have small production runs and to my knowledge, once sold out, they have never been reissued. I will also stress several times throughout this review that care needs to be taken when handling resin parts. A bit too much pressure and it could be tears before bedtime! 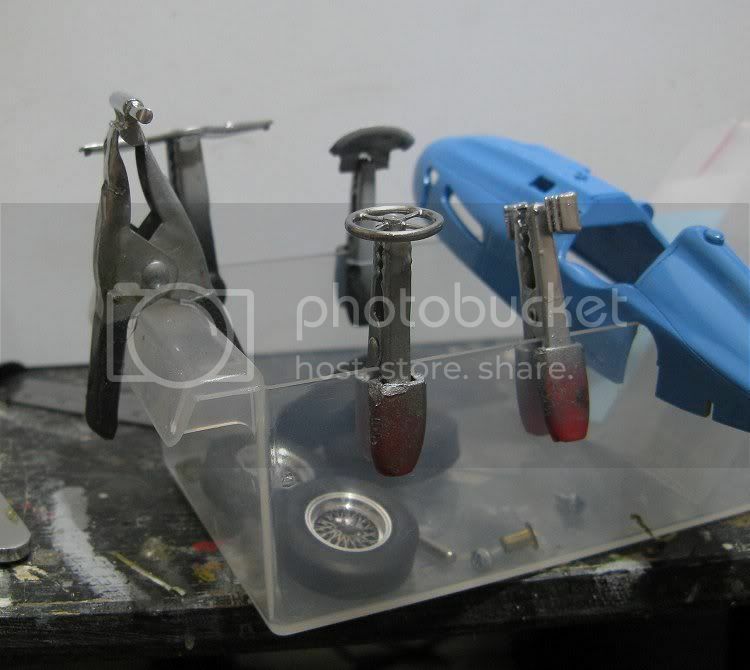 So, without further ado I will try and shed some light on the mysteries of resin kit assembly! The first task is to paint all those bits that will need painting. The resin parts will get a coat of flat grey acrylic just to act as a primer. The resin parts will also get a careful wash in mild soapy water because they may well have release agent on them from the moulding process, and this could effect the tenure of the paints causing them to chip easily along the way. The steering wheel is a great wheel but again a bit fragile so this will have as little handling as possible. The driver can either have his head fixed to its body before painting or after. I will be doing it before so there are no seams or joins to be made good after fixing. Other parts to be painted are the grille, the intake and exhaust, the suspension detail and after all else is assembled and lacquered, the seat upholstery will need finishing in a flat or preferably a satin finish. 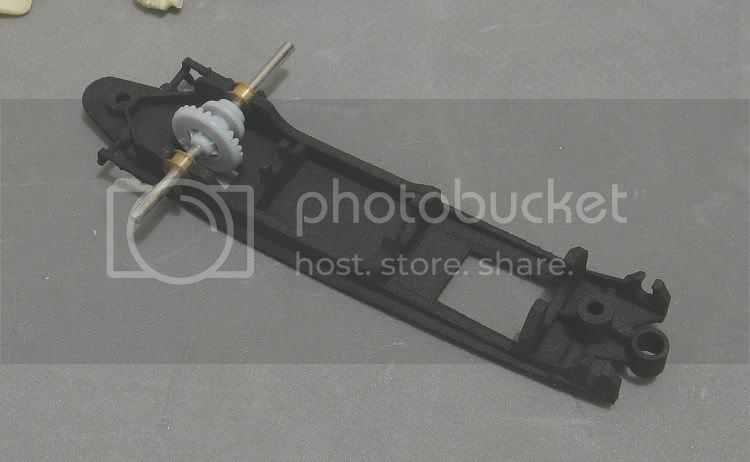 The header from the packet of parts gives a photo of what looks to be a real Talbot. Colour can be gleaned from this in the event of no on-line information. So what order will we be doing this in? The first priority is not to rush. We don’t want to ‘race it while its wet’ much like we did when we were young. Take your time with this model. Its not complex and there is no need to rush. When modelling I always like to have two or three other projects on the go. This minimises the need to ‘keep going’ with the one model. If an item is glued or painted, move on to something else and leave handling those glued or painted parts until the following day. Patience will pay dividends. Lastly, as this is a resin model, test fit all parts in their places first and make sure there is no further filing and fitting needed. The worst job is to get the steering wheel to fit in the drivers hands. It needs to be fixed in this position and not mounted to the dash as most models are. My solution was to carefully file and scrape the drivers palms until the wheel pushed in precariously from underneath!! Mmmmmm! First paint job is the matt black in the wheel recess. 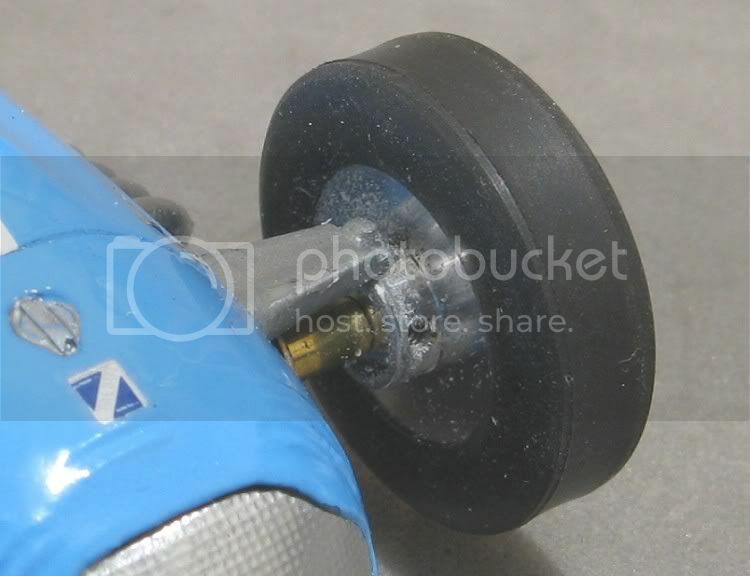 This will highlight the spokes and give the impression that the wheels are not solid. A warning here that the wheels may have a film of machine oil on them so these wheel need a light soaping and a thorough drying too. Once painted the paint should dry in fifteen minutes or so, so the inserts can be added after the rest of the resin parts have been primed in mid grey. All the parts to be primed, once having been washed, are to be mounted on their painting sticks. These are short bits of MDF or lolly sticks where masking tape or blue tack can be fixed to hold the parts while spraying and brush painting. With this model I made good use of several miniature crocodile clips from Jaycar! Get these parts primed and don’t even consider touching them ‘til tomorrow. With the paint curing we can move on to chassis and wheel assembly. The black should be dry by now but the wheels will still need a little bit of care because some of the parts are delicate and rushing will see them spoiled. I will translate the French instructions as we go. Trust me when I say I did French for five years (Forty years ago!!!) so the online Oxford will help me here. There are two strips of wheel inserts. Believe me when I say that one set has a larger hole in them. These are the ones that go on first. If, like me, you need corrective lenses to get you through the day you may well need to use a set of verniers to tell the difference; they are that close!! After this the single stepped side of the little alloy ‘hub’ needs to be inserted through the first insert and into the wheel. The second and smaller holed insert is then offered over the centre hub where it sits on the ridge. For best effect try and get the spokes out of phase with each other, this will enhance the spoke effect 100%. 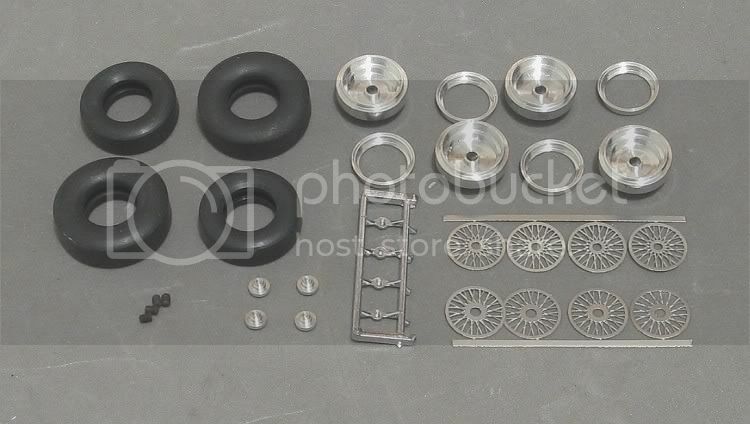 Some Monoplace classics have different size wheels and inserts front to rear and the wheel assembly instructions relate to this. But in the case of the Talbot the wheels are identical front to rear and no care need be taken to separate wheels and inserts front from rear. Next, the outer wheel rim needs to be pressed into place. This I did by applying several layers of narrow masking tape to the jaws of my modellers vice. With the spoke discs in place, the outer wheel rim was located firmly in the wheel. The spoke alignment was adjusted and the wheel then placed in the modellers vice. The outer rim was then carefully pressed into place. Last to go on are the knockoff wheel nuts. These are plastic, and with the wheels looking a million dollars the knock offs need to be cut carefully to avoid leaving unsightly black plastic at the cut edge. 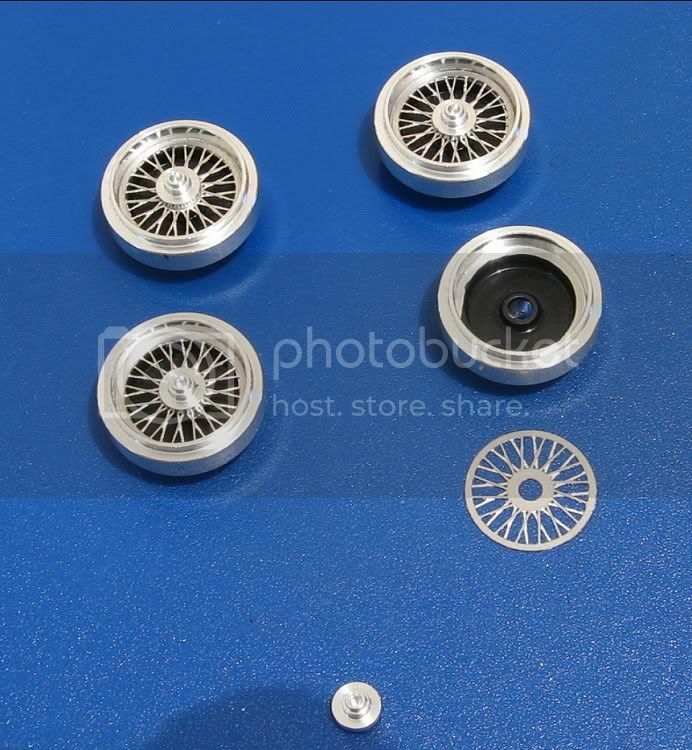 The last thing I would do after assembly is give the alloy part of the wheel face a coat of clear acrylic. This will ensure they retain their shine for years to come. I will also fit the grub screws, this will save me looking for them some time down the road!! Moving across to the chassis, the gear is pulled off the motor and the motor is pressed into its mount. Once in, the distance for the prop (tail, drive) shaft can be measured . ( I made it 27.93 m.m.) The tail shaft wants to be a mil or so shorter so it doesn’t bind. The shaft that comes with the kit is about 37.0 m.m. long so it will need to be measured and cut down The cut end will need to be fettled to aid its fit in the spring drive. The drive shaft spring is 12.0 m.m. long and we want the drive spring to go a little short of half way down, so lightly etch a mark on the shaft at about 6.0 mil. from the end and holding the shaft in a pair of small pointed pliers, twist the spring on by hand until it is just short of the mark. Finally fit the shaft bearing and the pinion and this should then be ready to go. Pop in the guide and after a quick trim of the guide leads the chassis is as good as done! Meanwhile, back at the body there is still work to be done. All the add-ons are made of resin. Some come in place in the model and need to be painted. When removing or handling resin parts always take care!. They are not as strong as plastic and will snap with the least effort. So, carefully remove any resin parts that might be in place. they will now need to be fettled so that the flash and other imperfections can be removed. 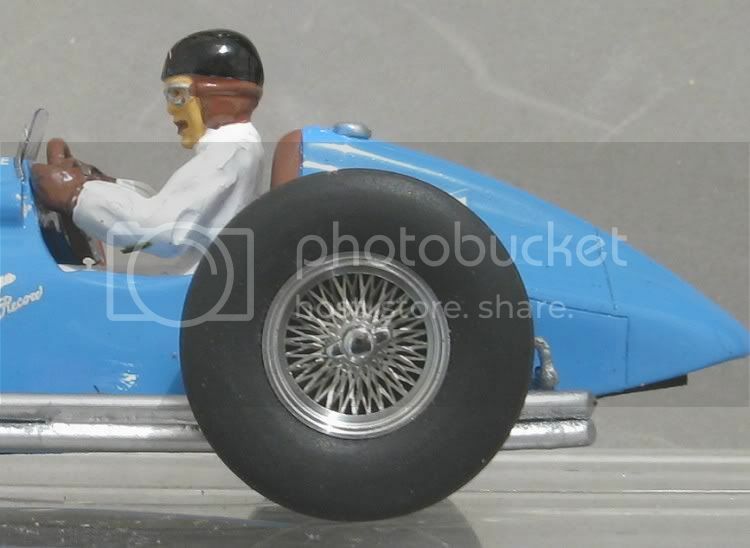 On this model, with the exception of the driver, all the resin parts are going to be silver. The parts were tidied up and mounted in small alligator clips. I have found these clips to be the best way of holding parts while you spray them and mounting parts when you want to leave them to dry. The first coat of paint was flat grey primer. This gives a better bonding surface for the silver and should ensure a bit of longevity for the paint job. Once dry I then sprayed the parts with ‘Bright Chrome’ from Repco’s auto stores. This is the best silver you will get as most other brush on silvers come across as metallic grey, but this is a real shiner. One other thing to do at this stage is to get the chassis to slip smoothly into the body. You don’t want to be doing this when it has been painted or lacquered or anything else. The rear spring hangers don’t slide comfortably into the body, so the body slots have to be opened up. This can be done easily with a flat modellers file. The chassis comes as a black finish and at first I thought it might be black plastic of a kind, but while I was painting the rear springs which are part of the chassis, I noticed there was a spot were the paint hadn’t covered and the chassis reveals itself to be resin also. No big deal but just handle it with a bit more care than you might. Also, the body mounting posts are moulded in resin as part of the body, so we won’t be putting the screws in with too much effort! Tapping out the screw threads should also be done at this stage. But before that I reinforced the posts. I filed a small flat on the pointed end of one of the screws. This behave a bit like a thread tap and gave the removed resin somewhere to go. If we were to screw the screws straight in, I could almost guarantee the posts would split. Next up I glued a short brass tube over both mounts. This also minimised the risk of the posts splitting. Once set, the filed screw was turned into the post half a turn and backed off a third. I continued to do this until the screws were three quarters into the post. After this the body was mounted on one of my ‘lolly stick’ jigs. With this I can handle and move the body about without disturbing decals or fresh paint. While all this has been going on the driver has copped his fair share of activity. First a good fettling and then a coat of grey. After this a coat of flat white. Because photos of the real cars are almost exclusively black and white I have played it safe and painted the driver’s overalls white. They may have been pale blue or khaki also, but we will never know!! Another coat of white was brush painted on. This thickens up the colour but still allows the grey just to show through in places giving the impression of folds and shadows in the overalls material. Next up was the flesh colour for the face. Again, Tamiya make a nice flesh colour but sometimes I will mix it or tone it down a little just to minimise the ‘too pink’ effect. The helmet is painted next then finally other head detail is applied with a very fine brush. The helmet colour will get a coat of clear gloss just to enhance the shine and add a little more protection. Remember when painting figures, always to paint the overlapping colours last i.e. If a sleeve over laps gloves, then paint the sleeve last. If a helmet overlaps a face then paint the helmet last. This will actually show in the finished paint job. If you have smudged a bit doing eyes and goggles, you will be able to paint over the smudges with flesh tinted paint again. I have applied all the decals by this stage and care is needed as they are quite small. I always advise folks to try and find the original car on the internet. This way you can make sure you are putting the decals in the right place. This model comes with basic instructions for the model but they are in French. There is a photo on the packet header but this isn’t very helpful when it comes to decals, but, fortunately, cars of this era basically only come with roundels and numbers, which isn’t hard! Three important items here are a pair of small tweezers, much like the wife uses on her eyebrows!! A supply of ‘Cotton Buds’ (Q-tips)and a short piece of ¼” dowel sharpened at one end with a pencil sharpener. 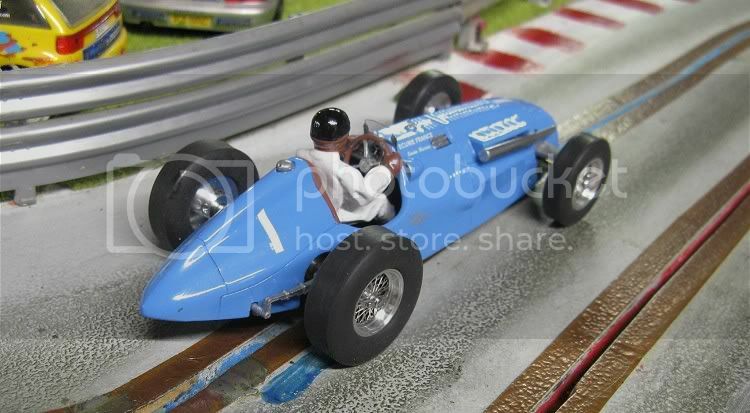 Firstly, the Monoplace website carries a good picture of the model with decals in place. Use this as a point of reference. Cut the decals into separate pieces and wet them one at a time. Immerse them in some clean tap water for about five seconds. It then takes about thirty seconds for them to loosen up. Using the tweezers, lift the decal on its backing paper to the position you will be applying it at. Place the backing paper on the body, then, with the bit of pointed dowel, lightly hold the decal and paper in place. Then gently pull the backing paper away, still pinning the decal to the body. If there is too much water around, just touch the edge of the water with a cotton bud and the excess will be soaked up. Move the decal into place carefully with the sharpened dowel and once in place, roll the cotton bud up to, but not on the decal from all sides. This will soak up the remainder of the excess water. Once done the cotton bud can be rolled lightly across the decal, this will squeeze out any remaining water from under the decal and soak it up. Be careful not to roll too hard as there is a risk of moving the decal out of place, and with less water around it will be a little harder to slide back into place. If this does happen, just dip one end of the cotton bud in some water and rehydrate the decal. After twenty seconds or so it should be loose again and you can then repeat the procedure. Finally, after a couple of days drying, the body gets a coat of clear to protect the decals, and once that is dry, the drivers seat upholstery can be finished in black or brown satin to emulate leather seat material. A word of warning. I was amazed at the good quality of the decals but disappointed at the poor quality of the decal adhesive. These are water slide decals and for many centuries now the tradition has been to soak the decal for about five seconds, then leave it to soften somewhere out of the way. A good decal should separate from its backing paper in twenty to thirty seconds. These came away a lot quicker which rang alarm bells. Once applied to the model, rolling them with a cotton bud proved difficult as they kept moving, as if there was insufficient adhesion? I finally got them all in place and left the model for three or four days. When the time came to apply a spray coat of clear over the decals, to my amazement, the dash decal and one of the bonnet strap decals flew off in the spray blast. I finished coating the model and put it to one side. There was then a hunt for the dash detail and bonnet strap. The dash detail was easy to find but as yet the bonnet strap has not turned up. I gave the dash detail a coat of clear on its back surface and replaced it in the cockpit. Once in place I gave it a brush coat of clear to help hold it......Pheeeeeeew!!! Once the body has cured it is time to insert the final detail. Remember, this is made from resin and kid gloves will be needed for some of the fitting. Too much force will see something break. Ideally, the parts should be tried in place before any painting starts. At least you know that when you get to the end it’s all going to fit without more filing and sanding. The intake, grille, front suspension and the silver bits in the bonnet are an easy fit. The exhaust pipes need more care as they are difficult to get in. If you have finished with the driver and are happy with him, it’s time to fit the finished steering wheel. Again, just a little clear epoxy applied to his hands should be OK .Don’t put too much on as it will ooze out when put in place. Also, once again, test fit the wheel before gluing so it ends up in the right place!! So where are we up to? One final piece of detail is the screen and the gear shift. The screen has a small piece of clear material which needs to be cut to size and shape. The small photo etched frame needs cutting from its sprue and carefully bent. The outer wings need to be folded back about forty five degrees. What I did with this was to apply some clear epoxy to the screen slot on the body. The screen was inserted and once in place a small amount of clear epoxy was applied to the inside of the screen frame. Using tweezers, the frame was carefully dropped in place. All this was then left to set for a day or so. The gear shift is more simple. 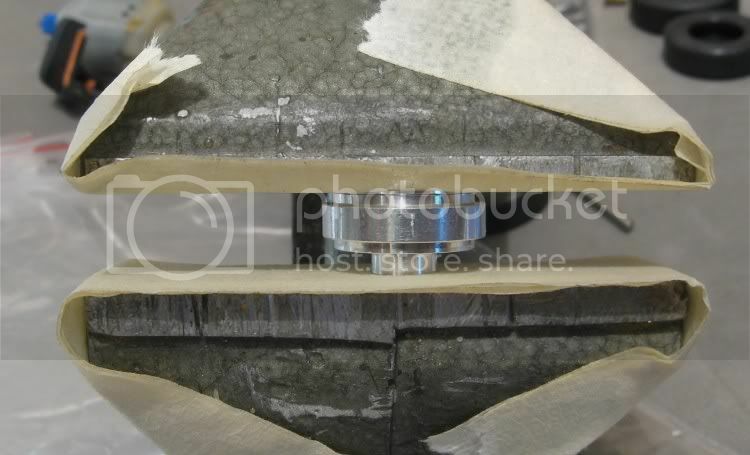 A case of a little clear epoxy on the bottom and gently placing it against the left side of the cockpit. Clear epoxy takes seven or eight minutes to set so things need to be held in place with blue tac or masking tape while they are setting. Everything is painted, everything is fitted. The front axle is installed, both the brass spacers are fitted to the front axle. The wheels are installed and last up is to get the driver and wheel in place. There is no seat or fixture for the driver, but he does conveniently sit on top of the drive shaft bearing. My solution here was to drill four or five shallow 1/16th” holes in his back. I also drilled a similar amount in the centre of the seat back. Extra strength epoxy was carefully applied to both sets of holes, a very small piece of blu tac was applied to his bottom and the driver was then placed in the cockpit and allowed to rest against the seat back and sit on the drive shaft bearing. The reason for the blu tac was that once the glue was set, the chassis could be removed and the blu tac removed too. This will have created an air gap between the driver and the chassis and removed the possibility of the driver sitting on the drive shaft bearing. The following day he was more than firm and in place. 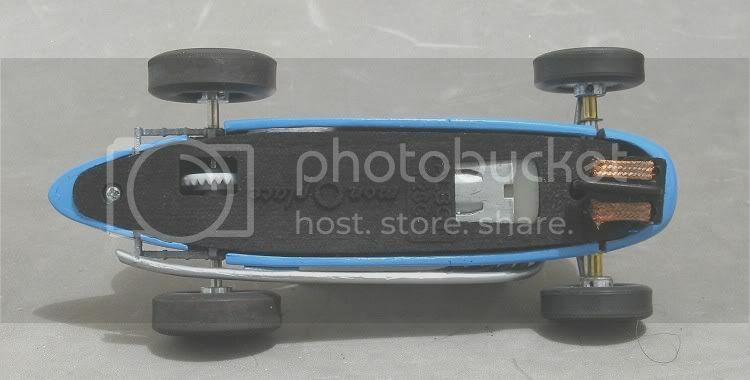 Once all was set and the model was assembled, I found that the front axle was binding or catching on something. The problem was the wheel fixing grub screw. This was catching on the top suspension detail. I removed the grub screws and ground off the end two threads with a dremel. On refitting, the head of the screw was flush with the hub boss and missed the suspension detail. This was it. All fitted together and screaming out for a track test. So there we have it, A very nice model and almost too good to go on the track. But a track test has to be done and off to the track we went. A short and technical four lane board track with copper tape awaited me and as it was a race day I decided to get some miles in after racing. This would ensure the track was in tip top condition and grip would be at a maximum. 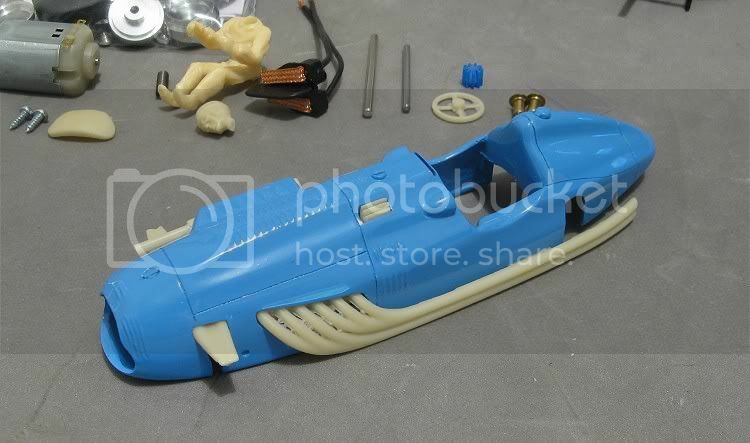 Remember, this is a resin body model with a front motor. 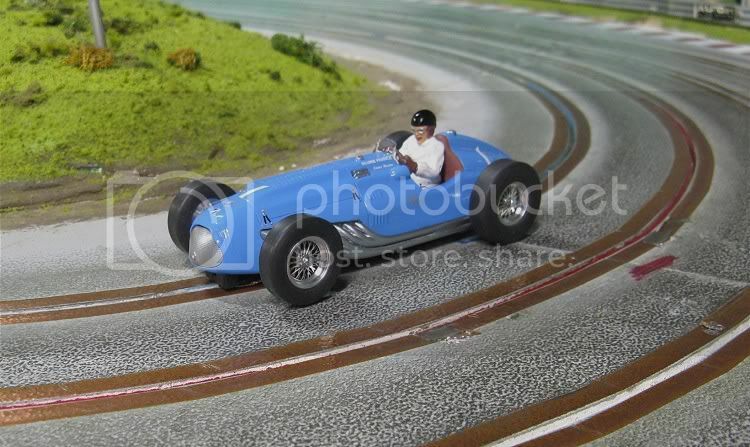 In the past (Ref: Maserati 250F) I have added ballast to the back of models to counterbalance the weight at the front. In this case I won’t be bothering as firstly, it isn’t my model, and secondly it may well never end up doing serious competition so it would be nice to keep it original. Once on the track, the first and only disappointment was that the model just wanted to snow plough and the back kept swinging out. The problem was soon spotted. When on the track the front axle moved up slightly causing both front hubs to touch the suspension detail and making the front end drag. I got the model moving and rather than disassembling it and filing stuff, I ran the model with the axle dragging. As expected, the hubs slowly wore away the offending resin and within a couple of dozen laps the model was flying. The tyre grip was excellent and there was very little tail sliding or indication that this was a front motor model! Tyre rubber is good for painted tracks and apart from a little sanding, they should be fine for most occasions. The front tyres come with a concave tread face. I would leave them like this as it will present a minimal amount of friction in the corners, where you don’t want it! This model has been a challenge because of some of the fine tolerances with resin parts. Getting the front suspension detail in is an art in itself. Also, wangling the rear of the chassis into place around the exhaust is also a potential source of consternation! But eventually it was all together and running. I give this model 9½ out of 10. Most of it based on subject matter, the rest on the accuracy and finish of the resin parts and decals. Yes, no doubt the Cartrix model, when it comes out, will possibly be a more accurate scale model, but this one will have detail the Cartrix may well not! The model comes in three stages of assembly. 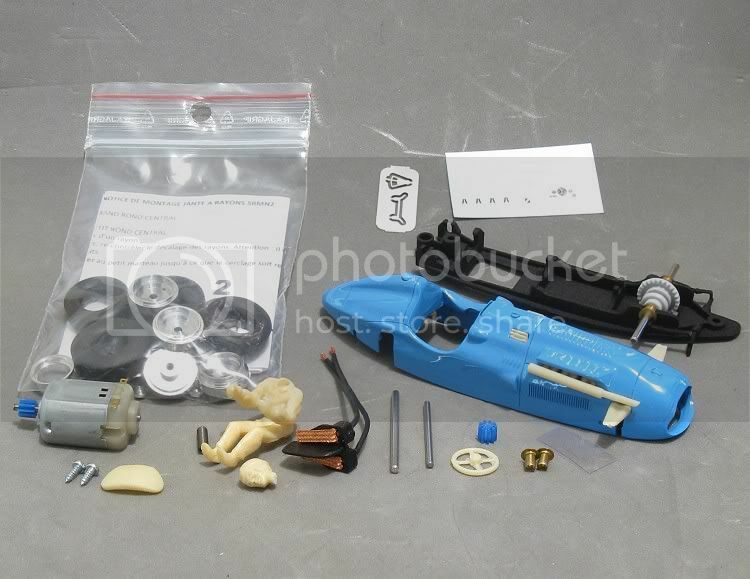 Complete knock down kit with no painted parts, CKD kit with painted body, and an assembled model, all priced accordingly! The only remaining concern is the long exhaust pipe. The left hand back wheel will need to be removed every time the chassis needs to come out, so it is going to be essential that this model goes together well; then chassis removing will be kept to a minimum. 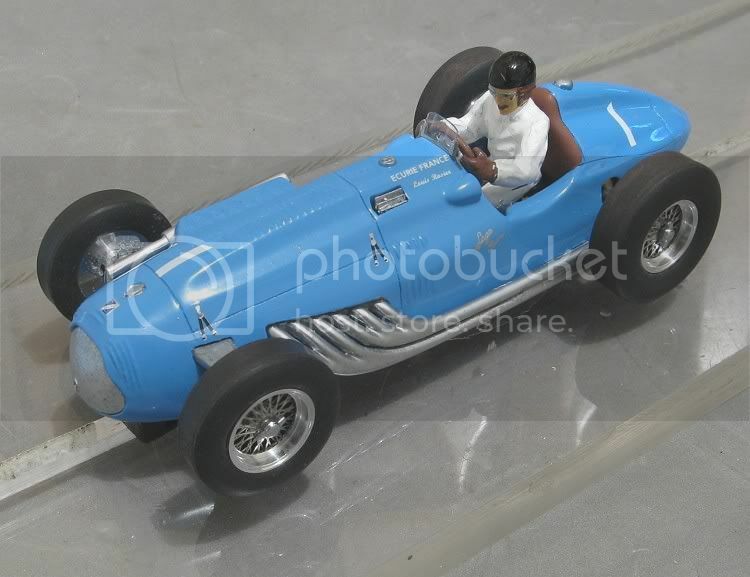 This is another great classic slotcar which has the added benefits of the weight and downforce of a resin body. The model drives well and although I suspect the front and rear track are a little wide for true scale, I would leave them where they are. This will generate some handy extra stability!! All we need now is some peers to race it against. I’m sure that between Monoplace and Cartrix, they won’t be too long in coming! 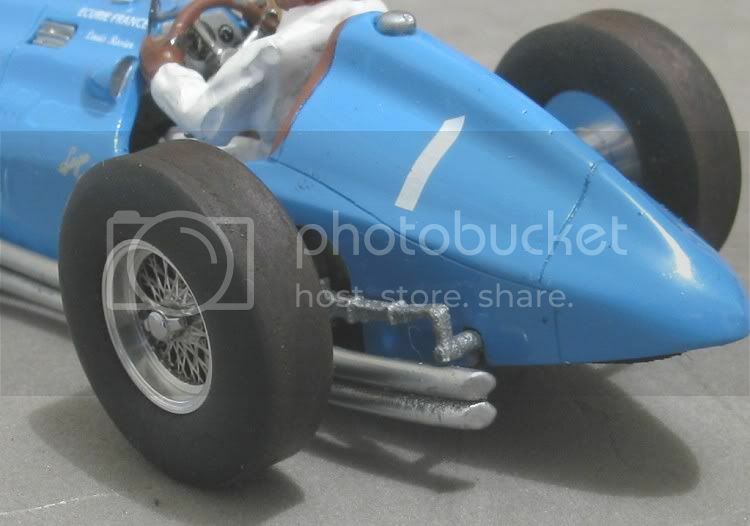 Many thanks to Chris Uttley of the Australian Scalextric Racers and Collectors Club for the opportunity to build and review this model for them. Footnote. 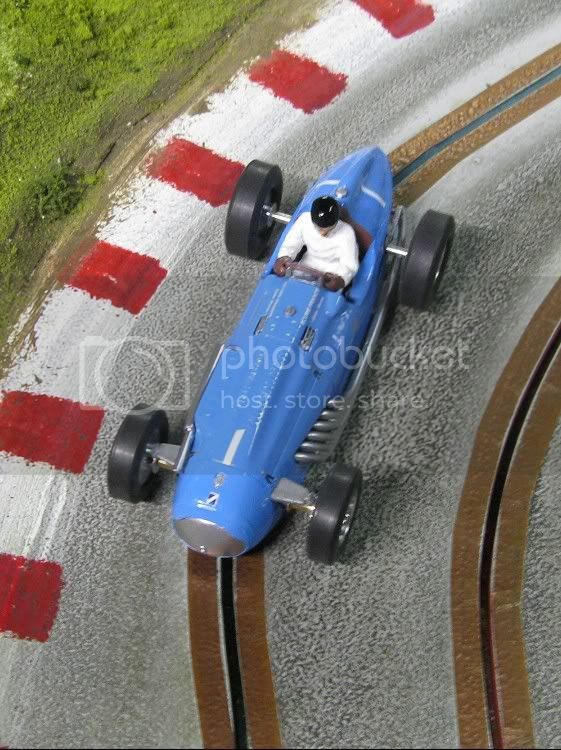 Since writing the review I have had an opportunity to run the model on Scalextric Sport track.How well did it go? Mmmmmm? The main difficulty was that the guide was a little too deep and it continually got caught in the bottom of the slot. Other than that there was no problem and I would fully expect it to perform admirably once the guide has been trimmed! 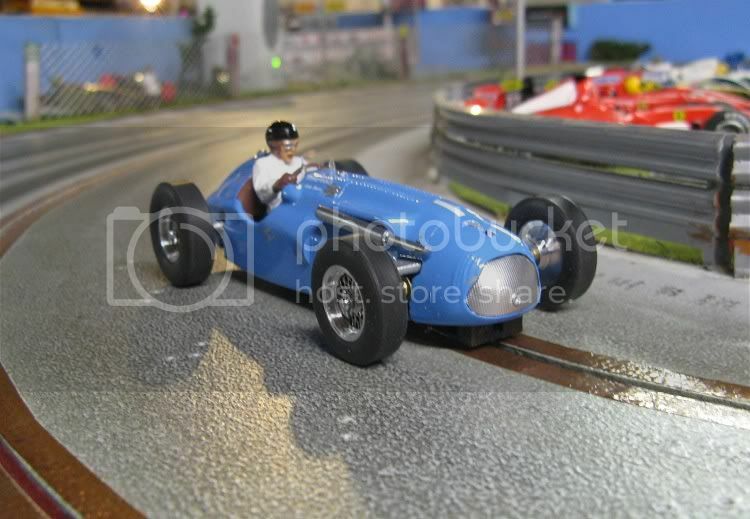 I recently took the model for an outing on the Red Team's track and was pleased with its performance on a faster track. One thing I did experience though was after about ten minutes I felt the model was 'winding up' to top speed. This may be because of drive shaft slip. I might just put a spot of solder on each end of the shaft spring.